September marked the third year anniversary since the Chevy Cruze was introduced in the North American market. Over the past three years the Cruze has found success in the younger market, being one of the top-selling Chevrolet vehicles to buyers under 25. In addition, it’s attracting new customers to the Chevy brand, with 40 percent of overall Cruze sales in 2013 being from non-GM owners. 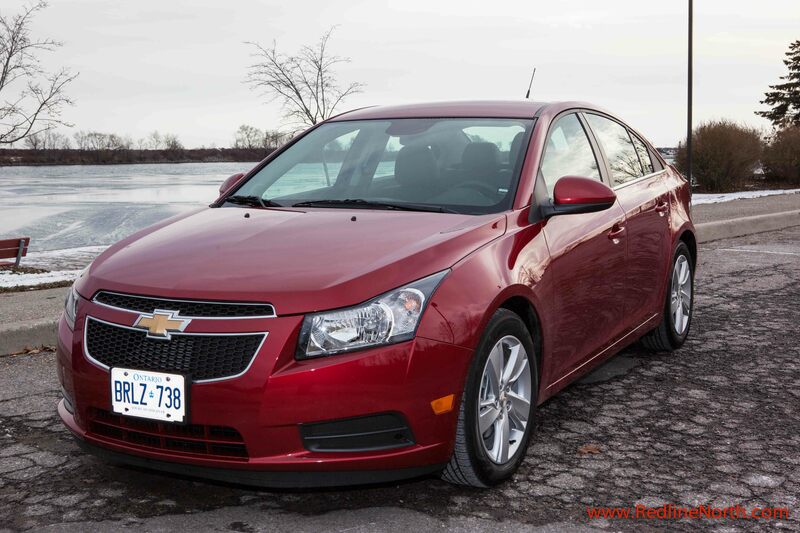 GM is hoping to building on this success by recently introducing a turbo diesel to the 2014 Cruze line up. With a rated fuel efficiency of 4.2L/100 km city and 7.5L/100 km highway, along with a 0-60 mph performance of 8.6 seconds, the 2014 Cruze Clean Turbo Diesel has the potential to bring a whole lot more customers over the Chevy brand. While diesel passenger vehicles have traditionally been popular in Europe, North Americans have shied away from diesel. There have been a few exceptions of course, with German automakers such as Volkswagen and Mercedes having a number of diesel offerings. Recently, however, other automakers are jumping on board with new diesel introductions such as the upcoming Mazda 6 diesel and the diesel version of the Jeep Grand Cherokee. 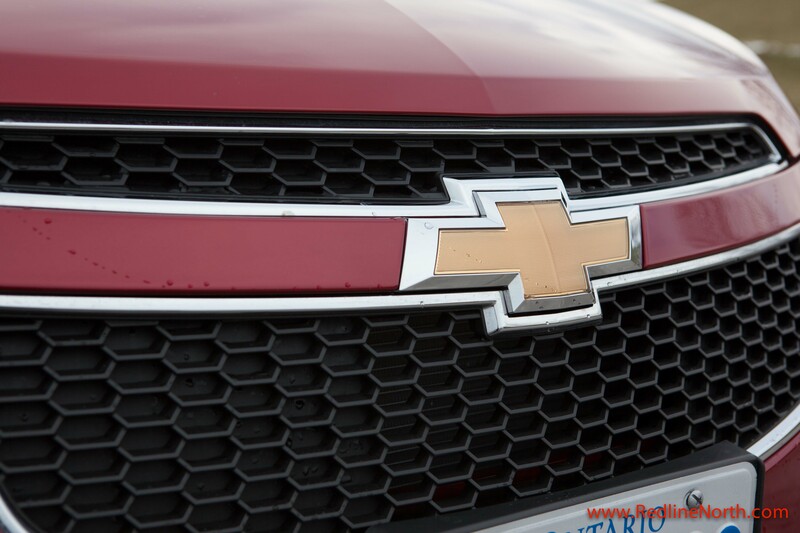 The primary benefits of the diesel engine, namely power and efficiency are seen in the 2014 Chevy Cruze. The new ultra lower sulphur diesel engine has also helped GM overcome the historical issue of higher tailpipe emissions associated with diesel. As a result the 2014 Cruze is able to meet the strict Tier 2 Bin 5 emission standards. The starting price of the 2014 Cruze Clean Turbo Diesel is $24,945. Our test vehicle also included the Enhanced Safety Package which included rear ultrasonic park assist, rear cross traffic alter and side blind zone alert. Add to that the striking crystal red tint coat and the convenience package and the total cost of our test vehicle was $28,225. The Cruze comes with a 3 year/60,000 km new vehicle limited warranty and a 5 year/160,000 km power train warranty and roadside assist. Despite a tiny green badge on the rear trunk indicating it’s a diesel you’d be hard pressed to tell the difference between the diesel and gasoline versions of the Cruze just by looking at it. This is also likely why when this reviewer was filling up the vehicle at the diesel pump of a local gas station two separate concerned drivers warned me that I was filling up my car with diesel. I politely explained I did know what I was doing and that the car was in fact a turbo diesel, which solicited a few long hard stares at the Cruze. 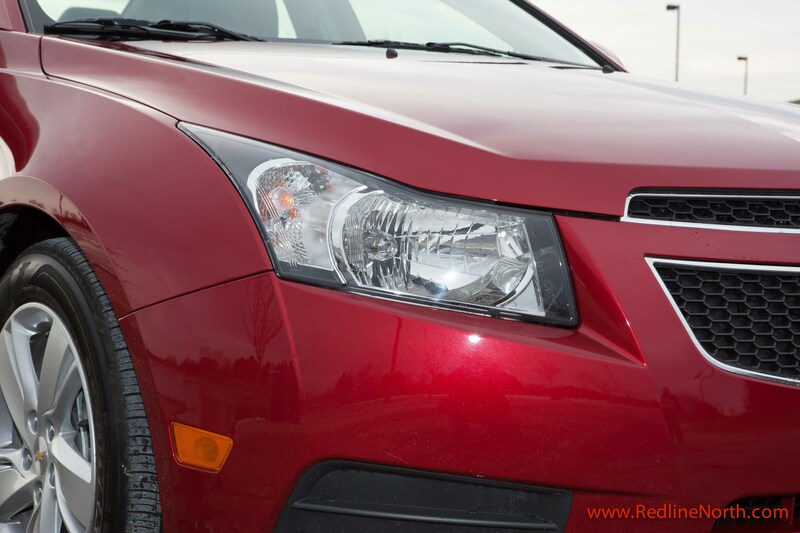 The chrome accents on the fog lights along with the swept back look of the headlights give the Cruze a sophisticated and sporty look which at the same time is backed up by the performance of its diesel engine. 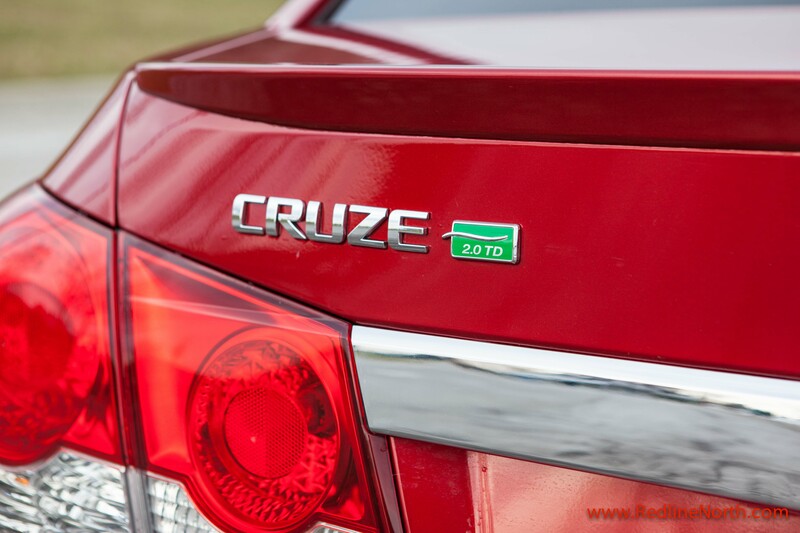 Off the line the Cruze diesel is a rocket, utilizing the 264 lb-ft of torque at its disposal. The Cruze also uses a turbocharging feature called “overboost” which can increase torque to 280 lb-ft for about 10 seconds of stronger acceleration. The boost is especially apparently when entering a highway onramp. The car also feels nimble with a short turning radius and good sight lines along with very little body roll in the corners. While there is some turbo lag, overall the performance of the diesel engine is impressive. Unfortunately, the Curze is only offered with an automatic transmission, unlike it’ main rival, the Volkswagen Jetta TDI. Upon starting the Cruze there is a distinctive diesel engine sound that is throatier than a gasoline engine. However, once driving it’s very hard to tell the difference in sound emanating from the engine and after a while its easy to forget you are driving a car with a diesel engine. 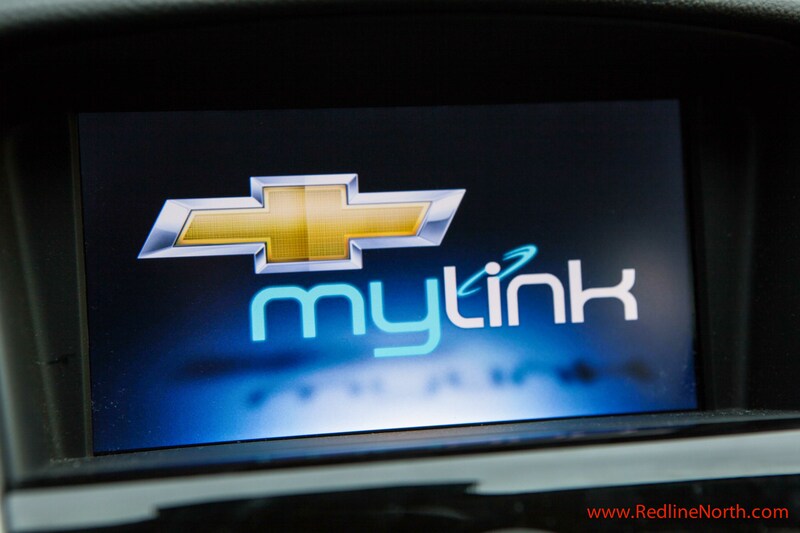 Entertainment options are plentiful in the Cruze with GMs MyLink infotainment system displayed on a 7 inch touch screen and paired up with a Pioneer premium audio system. Available Sirius satellite radio along with Bluetooth and USB connectivity in addition to available mobile apps means you’re all covered from a technology point of view. Button placement, from an ergonomic perspective, is also laid out well and is convenient. 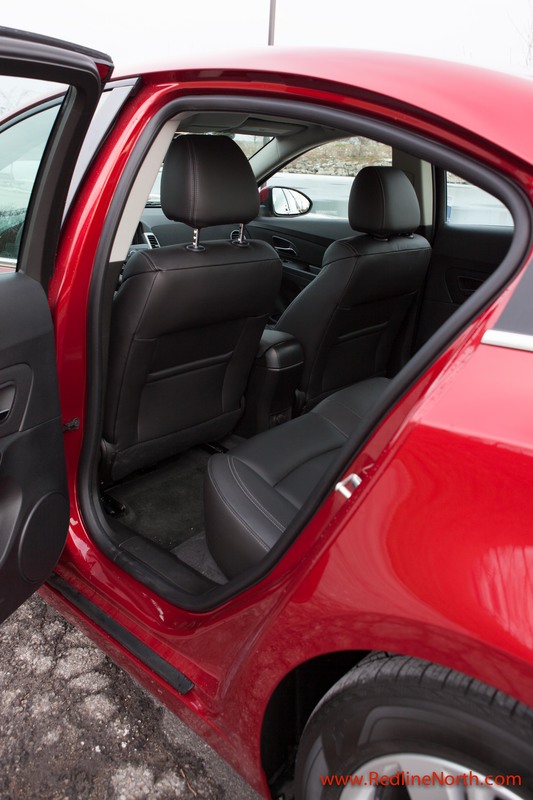 The Cruze is a compact car and as a result it does have somewhat limited interior space. For example rear legroom could be larger and installing a rear facing car seat is a challenge, while still providing adequate legroom up front. This isn’t specific to the Cruze of course, but rather the compact class of car. That’s not the say the space isn’t functional, it is, and GM has done a good job designing the interior to make efficient use of space. In addition, trips to the grocery store, soccer practice or even IKEA can be handled with ease thanks to the plentiful trunk space, along with the 60/40 split fold down rear seats with centre armrest. Competition for the 2014 Cruze Clean Diesel Turbo is similar to that of the gasoline version with key competitors including the Hyundai Elantra, Volkswagen Jetta TDI, Mazda 3, Ford Focus and Nissan Sentra. Enviable fuel efficiency along with spirited performance and a driving range of over 1,000 kilometres on a single tank of fuel help the 2014 Chevy Cruze Clean Diesel Turbo shake the North American image of what a diesel compact car can be. General Motors has finally come to the table in the North American market with some real competition in the diesel market. Those looking for a compact car should add the diesel version of the Cruze to their short list we think they will be pleasantly surprised. This entry was posted in Review and tagged 2014 Chevy Cruze, 2014 Cruze, Chevy Cruze, Cruze, Cruze Diesel, Cruze Turbo by northredline. Bookmark the permalink.